…an instrument with an entirely new sound-powerful, far reaching, expressive and beautiful. With its unique tonal quality, it offers the best imaginable link between the very high voices of the orchestra and the very weak ones or those with an very uneven timbre…Uniting strength and charm, it does not drown out the one kind and cannot be drowned out by the other – it is a perfect instrument! Antoine-Joseph Sax (1814–1894) created a family of instruments that included 14 saxophones voiced from sopranino through contrabass. The saxophone was first heard in the orchestral setting in 1844. With the limited choices of the bass voice in the orchestra, Berlioz’s Chant Sacré and Kastner’s grand opera The Last King of Judah were excellent opportunities to showcase the newly created instrument. Throughout the 19th Century, a devoted group of composers, including Halévy, Meyerbeer, Thomas, Bizet, and Massenet utilized the saxophone in the symphonic orchestra. Today little remains of the F/C pitched instruments, but works that include the saxophone as an orchestral voice are in fact numerous, the most well-known by Mussorgsky/Ravel, Ravel, Kodaly, and Prokofiev to name a few. Today the saxophone is one of the most popular school band instruments and can be heard in concert bands, marching bands, jazz ensembles, pit orchestras for musical theater productions and chamber groups (such as saxophone quartets and choirs). Recruitment is rarely a concern and in fact, instrumental music educators should be steadfast in maintaining a balanced instrumentation. The alto saxophone (as opposed to the tenor or baritone saxophone) is considered the primary instrument for beginning saxophone players and, in this early stage of development, there is no need to develop specialists on tenor or baritone saxophone. Producing a preliminary sound and learning the basic fingerings on saxophone are fairly easy; however, playing with a good tone and in tune is far more difficult. The old adage, “the saxophone is the easiest instrument to learn, but the hardest to master” does have merit. 1. Body – the primary part of the saxophone. It contains the majority of key work, and is the resonance chamber of the instrument. By adding and subtracting keys, the length of the air column is changed thereby changing the pitches. 2. Neck – the ‘bocal’ of the saxophone. It attaches to the body of the instrument, houses a portion of the octave key mechanism, and is where the mouthpiece is attached. 3. Reed – the sound generator. It is made out of perennial cane, plastic or other synthetic material. 4. Mouthpiece – the connector that allows air to pass through the saxophone and, with the aid of the reed, produce a sound. The key components to the mouthpiece are: the table, tip, facing and chamber. A number of materials can be used to produce a mouthpiece including hard rubber, plastic and metal. 5. Ligature – secures the reed to the mouthpiece and allows the reed to vibrate freely. Although traditionally made of metal, ligatures are also made out of leather, plastic, wire mesh, or string. 6. 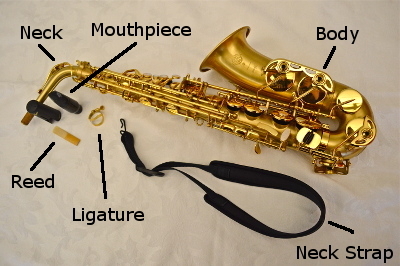 Neck strap – a key component to playing the saxophone. If used properly, it bears the weight of the instrument. A neck strap or harness that supports the instrument on the top of the shoulders rather than the neck of the musician is recommended for beginners. Other accessories: cork grease, cleaning swab and a soft cotton cloth to wipe down fingerprints, etc.